As an educator, C.S. Lewis means a lot to me. 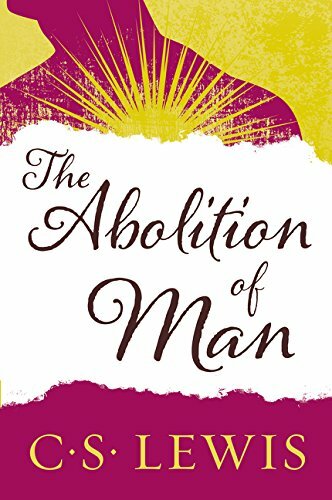 In particular, Lewis’ work The Abolition of Man is especially insightful. The work is short. It is more like a glorified essay than a book. If you had a couple hours you could probably read it in one sitting. However, grasping all that Lewis has to say in The Abolition of Man could take years, even for the learned scholar. Perhaps you think I’m overstating it on that last point, but I can assure you I’m not. This last summer I had the privilege of attending the annual conference of the Society for Classical Learning, in Stone Mountain, Georgia. The highlight of the conference for me was attending a breakout session lead by Ken Myers. If you are a regular reader of St. Anne’s Manor then you will know what high esteem I hold Ken Myers in. His book, All God’s Children and Blue Suede Shoes, is probably in my top five list for nonfiction books. Myers’ breakout session was essentially a sprint through The Abolition of Man, with particular emphasis on the depth of Lewis’ medieval references throughout the work. I would say that everyone at the breakout session had read The Abolition of Man at least one time. However, most walked away realizing that we had picked up about .05% of Lewis’ references. What many people don’t know about Lewis is that he was a professor of medieval literature at Cambridge University. This was his job. Your casual observer/reader of Lewis will most likely assume that he was a writer and a public intellectual. And, in many respects, that is true. Yet, it is not the whole truth. Lewis’ popular writings are one side of the coin. His academic writings are an entirely different side. Books like: The Discarded Image, The Allegory of Love: A Study in Medieval Tradition, Spenser’s Images of Life, and Studies in Medieval and Renaissance, are all examples of Lewis’ academic side. One of the (many) incredible things about Lewis was that he was able to write books like these and books like The Chronicles of Narnia. In many ways The Abolition of Man, serves as a bridge between Lewis’ “popular” writings and his “academic” work. It is appropriate that it is a book in critique of modern education. The reason I say this is appropriate is because the Medieval world was an imaginative world. Furthermore, much of Modern education is an abandonment of a vibrant imagination. For every one pupil who needs to be guarded from a weak excess of sensibility there are three who need to be awakened from the slumber of cold vulgarity. The task of the modern educator is not to cut down jungles but to irrigate deserts. The right defense against false sentiments is to inculcate just sentiments. By starving the sensibility of our pupils we only make them easier prey to the propagandist when he comes. For famished nature will be avenged and a hard heart is no infallible protection against of soft head. The fear of the modern mind is that “sensibility” will lead to weakness. But what the modern mind cannot grasp is that “sensibility” is unavoidable. Everyone will be sensible to something. Lewis sees this and shows his readers that it is precisely those whose sentiments have not been awakened by wonder that will be the “weakest” in defending themselves against the propagandists. Lewis teaches us that the best way to defend children from believing in falsehoods is NOT by telling them that fairytales aren’t real. Rather, by inculcating the just sentiments that fairytales offer, children WILL be able to better defend themselves from falsehoods of the worst variety. Those of us in the realm of classical education call this the “moral imagination.” The moral imagination is the concept that virtue is cultivated most fully in the realm of a person’s imagination rather than in the realm of a person’s reason. This is not to say that rationality has nothing to do with virtue (quite to the contrary). Rather, this is simply saying that we are formed (morally and virtuously) in a more profound way through the cultivation of our imagination than we are through the cultivation of our cognitive capacities. The Medievals understood this. C.S. Lewis understood this. In many ways, we moderns do NOT understand this.